GAINESVILLE - Brenau University’s curious collection of large, inscribed rocks once purported to hold the key to the disappearance of the English colony from coastal North Carolina more than 400 years ago apparently gained a measure of historic importance with the production and broadcast of a two-hour special Monday on the History Channel. Filmed in part on the university’s Gainesville campus, where the rocks reside, Roanoke: Search for the Lost Colonychronicles Brenau’s acquisition of the so-called “Dare Stones” in the 1930s and the controversy that swirled around them during the past eight decades. However, the program also reported on findings from recent reexaminations of the stones and other related materials, as well as discoveries in a new archaeological examination at a site in coastal North Carolina. Some experts participating in the program said they believe one of the stones is very likely legitimate and could help solve the mystery of what happened to early English settlers on Roanoke Island in the late 1500s. Haywood Pearce Sr., who was president of Brenau at the time, acquired the first stone in 1937. His son, Haywood Pearce Jr., who had a dual appointment as vice president of Brenau and history professor at Emory University in Atlanta, recommended the acquisition after Emory declined to accept it. After advertising a reward for any similar stones that anyone might have in their possession – a tactic now regarded to be a mistake – the institution wound up with dozens of rocks, all apparently carved by the same hand with Elizabethan-era writing. Although the scripted docudrama compressed characters and events and took some literary license in reenactment of actual events, it was the culmination of about two years of research by Georgia film producer, director and writer Brandon McCormick. Emily “Sissy” Lawson of Gainesville – a Brenau trustee and the granddaughter of H.J. Pearce – said she thoroughly enjoyed the latest History Channel presentation. Born a decade after the acquisition of the stones and several years after the deaths of Pearce Sr. and his widow, Lucile (who was also involved with the acquisition of the stones), Lawson said she culled most of her knowledge of the famous Dare Stones deal from third-hand accounts. She said Monday’s program cleared up some of the hazier details of her grandfather’s arrangement. Cassidy Jordan Collier, a junior communications and public relations major from Lincolnton, Georgia, attended a campus viewing party at the Thurmond-McRae Lecture Hall on Monday night. As a freshman perusing boxes of information and artifacts in the special archives at the trustee Library, Collier encountered the first of the stones that Brenau collected. “I always remember the original Dare Stone sitting there, and I would always just look at it and touch it and be amazed at the story that it holds,” she said. Although she said she had her doubts about the other rocks, said said she always thought that first stone was authentic – a belief the History Channel presentation affirmed. Brenau acquired the 21-pound rock from California vacationer Lewis Hammond, who unearthed the stone from the coast of North Carolina during the Great Depression. It was called “the Dare Stone” because its markings were believed to have been made by Roanoke settler Eleanor Dare, who was the daughter of colony founder John White and mother of Virginia Dare, regarded as the first English child born in America. The source of the rest of the rocks was a Georgia stonecutter from Fulton County named Bill Eberhardt. All told, he provided the university with 42 carved rocks, each advancing the narrative started on the Hammond stone of the odyssey of the Roanoke settlers. After a Saturday Evening Post article in 1940 declared all of the stones to be fakes, interest in Brenau’s unusual rock collection waned. 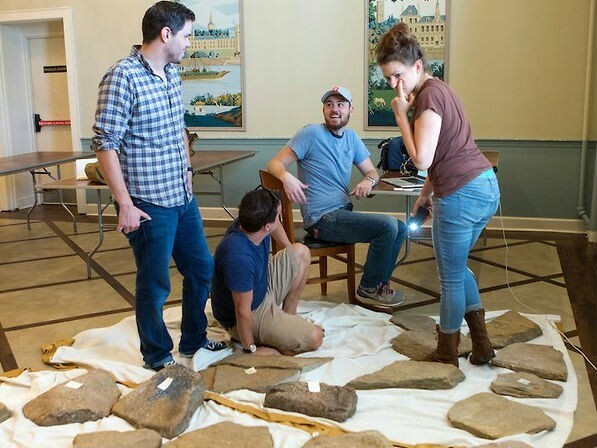 However, the stones never truly faded from the national consciousness, as the offbeat assortment continued to draw attention to Brenau in the form of coverage from television programs like In Search Of..., America Unearthed and Mysteries at the Museum. Although there are a few who believe them to be real, the Eberhardt stones now are regarded to be fakes, and the newest History Channel chapter in the saga more conclusively enforced that belief. Roanoke: Search for the Lost Colony took a closer look at all of the rocks and made some interesting discoveries – particularly in regard to the Hammond stone. A linguist and scholar with expertise in 16th century English and printing conventions pointed out a subtle marking – a superscripted etching that many historians mistook for the word “YE” that actually meant “the.” None of the dozens of experts who have examined the stone since 1937 have ever point that out. Southerland, professor emeritus at Brenau, has long held a belief that the first Dare Stone is legitimate. He said that the information about the superscript “E”, in conjunction with recent archaeological findings in North Carolina which uncovered 16th century English objects alongside the artifacts of indigenous peoples, reinforced his belief. That is also a sentiment held by Fred Willard, who started the nonprofit Lost Colony Center for Science and Research in North Carolina alongside the late Meredith College history professor Thomas Parramore about three decades ago. As the key to unlocking what many academics describe as the greatest mystery in American history, Willard said Brenau very well could have its hands on bona fide national treasure. The History Channel presentation can be streamed online at http://www.history.com/shows/roanoke-search-for-the-lost-colony. More information about the Dare Stones is available online at http://www.brenau.edu/darestones.